Latest survey results show that organizations from all industries gain competitive edge through professional project management software. San Francisco, October 13, 2014 – Organizations across all industries consider project management to be the competitive advantage of the future. This is the result of a study conducted by InLoox, project management software provider, in partnership with Ludwig-Maximilian University Munich, one of Germany’s globally renown academic institutions. The study addressed two main questions: Why do companies look for software solutions to support their project management and how will project management develop in the future? According to the survey that closed in September 2014, projects will become more complex and ambitious, making flexibility one of the main criteria for choosing a project management software. The nation-wide survey included responses from 135 project managers, executives and project management experts from the IT & Communications sector, service and manufacturing industries. A great majority of the respondents (82 percent) are currently working with a professional project management software tool. Moreover, a total of 69 percent of the survey participants have been involved in the decision making process that lead to the acquisition of a project management software or switching their project software provider. The online survey has been supported by a qualitative study that included twelve in-depth interviews with project management experts. The survey respondents confirm: Project landscapes are dynamic. According to project management experts, future projects will become even more complex because clients’ requirements prove to change in ever shorter intervals with growing demands in quality of the deliverables. Companies have to react to these challenges in order to have staying power in today’s globalized and competitive business environment. An overwhelming majority of survey participants (81 percent) said, that they started researching project management software because they had difficulties keeping an overview in previous projects. A total of 73 percent of the respondents said that they considered professional project software because of the ever growing importance of project-based work in their organizations. Another major motivator for searching software is the lack of efficiency in project-based work, as 58 percent of the participants explained. Apart from optimization efforts, imminent issues in the project execution triggered the search for professional project software: 52 percent of the survey participants said that information had been lost in the hectic of everyday project routine. Another 45 percent of the respondents said that an imbalance in resource utilization had led to difficulties in the project delivery and 44 percent mentioned issues that resulted from incomplete project documentation. The online questionnaire allowed multiple answers for this question. While streamlining business processes is one of the decisive factors for acquiring a project management software, customer loyalty strongly depends on the software’s user-friendliness and flexibility. 70 percent of the survey participants said that changes in intra-corporate processes made it necessary to switch the provider because the previous software wasn’t able to adjust to the organization’s new requirements. A lack in usability was the reason for switching products for 58 percent of the interviewees. The study finds, decisions about implementing project management solution are being made by C-level executives – the top management is involved in every step of the selection process. In fact, the impulse for searching a project management software comes from the executive management in 22 percent of the cases. Only slightly more often (27 percent of the cases) does the project manager initiate the search for a project software tool. No matter on which level the search originates from, in 37 percent of cases the final product decision is being made by the CEO, followed by the department head (25 percent). In companies with less than 250 employees, the decision making process proved to be more democratic than in companies with a greater labor force. When it comes to small companies, employees have a decidedly stronger voice in the product decision. Smoothly running projects are already crucial for companies today and its importance for business success will increase in the future. More than 70 percent of the participants attest that project-based work will grow in significance for their specific organizations. Almost every survey participant considers successful project management to be one of the decisive factors, if not the key factor, when it comes to gaining competitive edge. This outlook makes it essential for companies to be able to adjust to rapid changes in the business world. 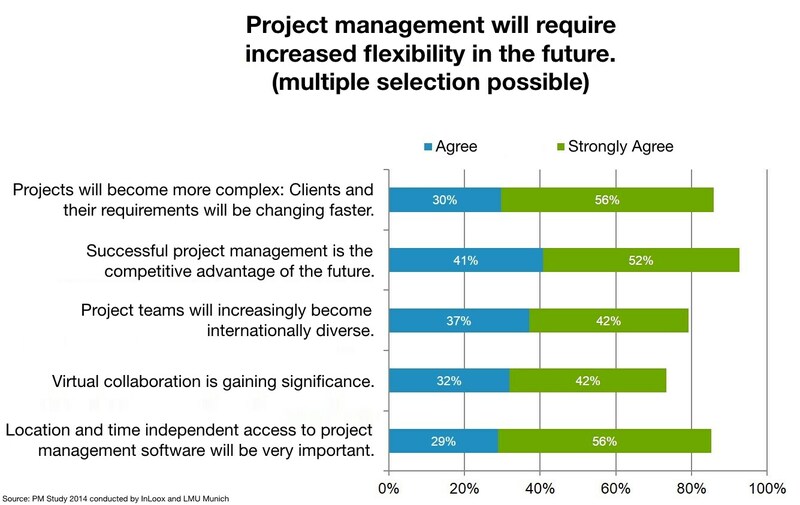 Therefore, flexibility in terms of time and location are indispensable factors in the formula for successful modern-day project management, the great majority of respondents (86 percent) agrees. “Our products fulfill exactly these requirements,” says Dr. Andreas Tremel, CEO and co-founder of InLoox. He emphasizes: “Project management software needs to fit into your everyday work routine in order to be of real benefit. When talking to our customers, we found that flexibility is a central criteria when it comes to professional project management software. The users want to be able to collaborate with their teams in a virtual, real-time work space, no matter where they are and which device they use.” The study proves that InLoox achieved their goal of providing a user-friendly and easy-to-use alternative to MS Project: InLoox-PM-users are more satisfied than MS Project users. Project Management – The Competitive Advantage of the Future | Study by InLoox & LMU • Copyright 1999-2019 © InLoox, Inc. All rights reserved.